After going to the grocery store, I made the mistake of assuming I would have fresh ginger at home - I hate when that happens! So what follows here is the modified version using dried ginger instead of fresh. It still came out good though - loved the ginger and the grilled flavor, and I served it over rice. I also made the mistake of not informing my family that I had planned out dinner, so when I returned home from the grocery store there was a steak marinating, oops. 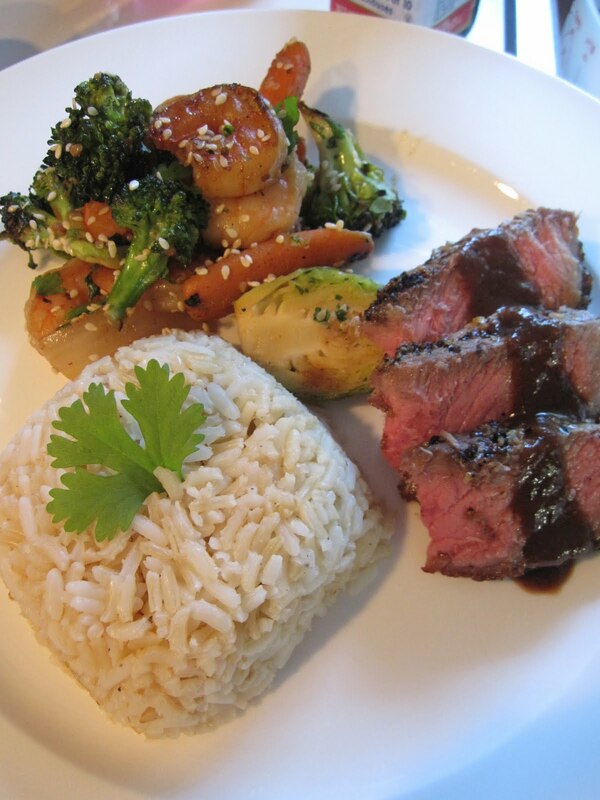 Easy solution - Surf and Turf night! *Toasting sesame seeds: Use a nonstick pan over med heat, add just the sesame seeds - no oil or liquid, and toss the seeds pretty frequently until you notice them turning a light brown. Be careful to watch the seeds and stir them around a lot so the seeds don't burn, which will happen fast if you're not careful. Homemade BBQ Ribs - Summer is here! With a few days of some sunny warm weather it means it's peak grilling season! Forget about going out for dinner - we can have a feast right at home. We had a giant rack of baby back ribs on hand and with Bobby Flay's book, Boy Meets Grill, I got this idea from there. It was originally a recipe for chicken, but I liked the sound of the ingredients and thought, why not put it on the ribs instead. My family had been saving this place for a night that the whole family was around - which is a rarity these days, between my moving back to the city and my brother's work schedule. 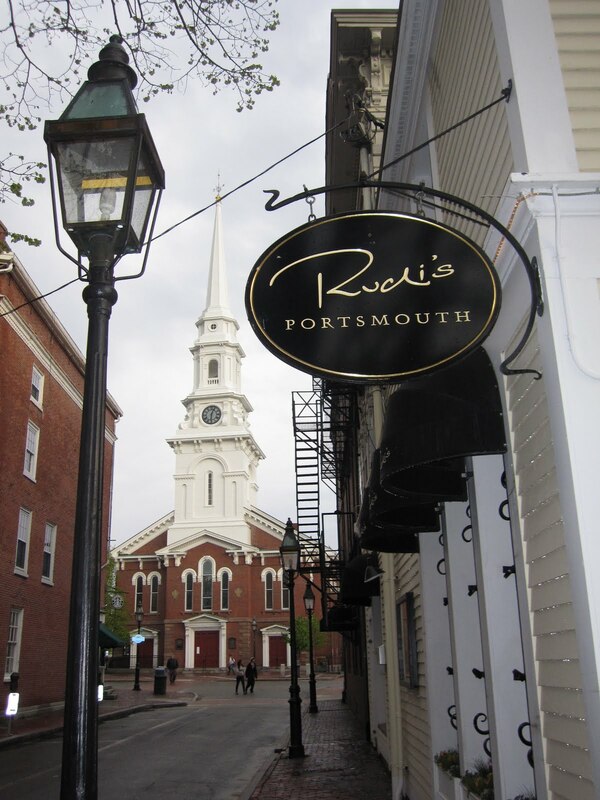 We finally found a night over mother's day weekend and took advantage of it to head out to Portsmouth, NH to try out Rudi's. Overall, it was a delicious meal and albeit, a bit pricey, it's a nice special occasion treat. They call themselves "contemporary American," whatever that means these days. I always tell myself I'm going to plan out my meals for the week so that when I go grocery shopping I buy things with a purpose in mind, not just aimless purchases that I hope will create some semblance of a meal. This week I sort of did this - but I also made a point to utilize some things from my freezer and fridge that needed to be used. The result? This lovely, organized and well-planned out set of meals for my entire week, which gives me no excuse not to go to the gym after work because dinner will already be made. It will also guarantee I get to work on time because I won't have to make my lunch in the morning! This list provides me with the basics - I'll add some veggies here and there, as I noticed I'm needing some color, which usually means you don't have enough vegetables! Last weekend I went to the first of four weddings I have this year. It's going to be a busy wedding year - but I'm very excited to share in so many friends' and family's special days! 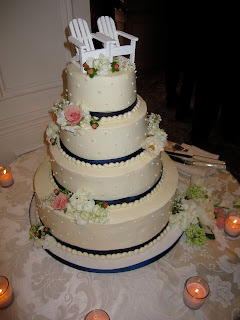 In the process of planning for the wedding I'm in August I remember the cake woman said that you'd be surprised how often little kids topple over the cake at a wedding. I think that might be the worst thing that could happen at a wedding. Rain - you'll make it work, but no wedding cake?! What a sad thought! Thankfully at the wedding this past weekend there were lots of well behaved children - so no cake was toppled over, and it's a good thing because it was beautiful! The navy blue and light green wedding colors were brought into the cake and given the setting down on Cape Cod, I loved that they used little adirondack chairs in place of a bride and groom cake topper. It was simple and had real frosting - not fondant, which I appreciated very much! When the cake was served I found my piece to be a lovely white cake - I heard that others had chocolate, so the variety was nice too. Congratulations to the new Mr. and Mrs. Schneider - I hope that you're having a wonderful time in Italy enjoying all of the amazing cuisine and wine it has to offer! These were probably the most successful accidental cookies I've ever made. Basically, this means that I had a bunch of ingredients lying around that needed to be used and so I decided to chance throwing them all together in an attempt at making a cookie. You'll read all of these ingredients and think I was crazy - but talk to anyone who ate them and I think they'll agree that they were a success. I would definitely make these again! Late last week I found that I had a few things left in my fridge that needed to be used: broccoli, baby spinach, celery, scallions - the usual suspects that I inevitably throw together to make a soup. Soup to me is the easiest dinner to make - yes, it requires lots of chopping, but otherwise the prep work is pretty easy and it creates good leftovers to bring for lunch. The flavor of this soup was great - thanks to the fresh lemon juice I used, but the texture could use some improvements, so this is Lemony Spinach Broccoli Soup, round #1. *You could make this recipe vegetarian by substituting vegetable broth for the chicken broth. 2. The Best Cookies I never meant to make (and they might even be sort of healthy!) 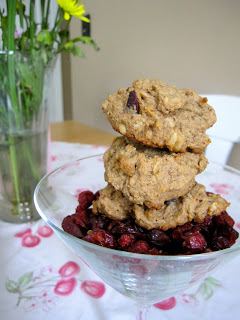 - think banana, peanut butter, raisins, flax seed, wheat flour ... yes, all in the same cookie. 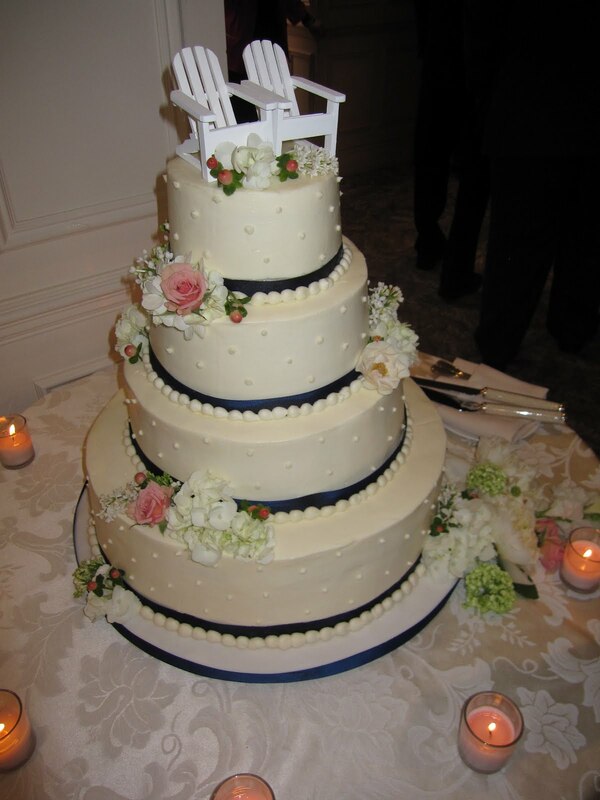 3. Who can say no to wedding cake? 5. Food and Science - the totally unexpected, yet impossibly difficult to get into, undergrad Harvard course that started last fall! So stay tuned, and as always, thanks for reading! It's true. My old roommate and I found this great recipe online that we planned on cooking this week after work one night. We went to the grocery store, where I insisted that I had a box of quinoa at home, only to find that, in fact, I did not have quinoa at home. 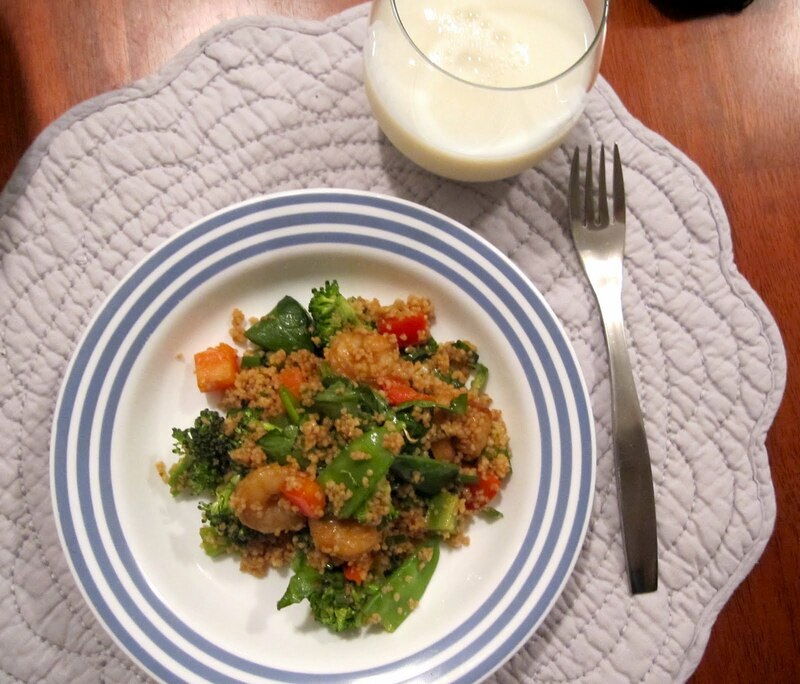 We wouldn't let it ruin our dinner though - and quickly decided that a good substitute for the quinoa would be a whole wheat couscous, which I did have on hand in my kitchen. So, here is the recipe for what was originally supposed to be "Toasted Quinoa Salad with Scallops and Snow Peas." Oh yeah - we changed the scallops to shrimp and added more veggies too, so basically it's a new recipe but thanks to the Eating Well website for the original inspiration! *I used a medium sized, already cooked shrimp (which = 9 shrimp per serving) which I defrosted and took the tails off. Feel free to use fresh and just add a bit more cooking time than we did during that step. Foodie Finds in the City! There is never a shortage of things to do or restaurants to try in the city. Within a mile of my apartment there are easily over a hundred restaurants I think. Venturing a bit further than a mile (okay, maybe 1.3 miles) - I had read about this wine and local food tasting at a local wine shop in Somerville, up by Ball Square. Ball Square Fine Wines is over by Tufts on Broadway Street (716 Broadway to be specific). I grabbed a new coworker friend of mine and we made the trip over to check the event out. They have a "tasting bar" every Friday night where they let shoppers sample different wines being highlighted each week. I'm not sure that this alone would've gotten me there, but they had this special tasting going on a couple weeks ago where they also had local restaurants coming in to let guests sample their along with the wine and beer they were sampling. Now that caught my eye! And I'll be honest - I remember the name of the restaurants, but could not tell you the name of the wines they were sampling for anything. They had a white and a red (in addition to 2 or 3 different organic beers), but neither my friend or I loved them. The white was too sweet and the red too dry, in my opinion. When we got there we noticed a line out the door but it wasn't to get in, rather a line for one of the restaurants sampling their food. We skirted around this long line, made our way inside and found another restaurant sampling some of their foods instead. Everyone was very friendly and the first restaurant was called True Bistro (1153 Broadway St), known for their vegan menu (they also offer gluten free and nut free menus). I was pleasantly surprised - and they were sampling 4 or 5 different dishes from their menu: black bean and plantain torte, tempe and walnut pate, vegan brownies (yum! ), a homemade cheese that was made out of some sort of nut (I still don't really understand how that works) and maybe one other dish. The tasting definitely inspired me to try out the restaurant, though I don't think I'll be going vegan anytime soon - it would make my cooking much more challenging and I love my milk!! It's summer time - and it's official because we've started grilling again! It's just not the same when you're using the grill and there's snow on the ground - so now it really feels like summer. The thing with cooking seafood is that whenever you plan ahead you get to the grocery store and the fish you'd planned on doesn't look good. Have a backup plan. In my case - I like going to the seafood department and seeing how the different options looked. Even though the swordfish was on sale it didn't look great so I opted for the salmon, which looked pretty good and was only $8.99/lb. For 3 people I got 1.23 lbs, which was a pretty good amount with just a little leftover. The actual salmon part of this recipe doesn't take a lot of preparation because you'll top it with the homemade salsa. I just rubbed about 1-2 TB olive oil over the salmon filet, as well as a little salt and pepper. You can make the salsa ahead of time if you'd like, but make sure it's done before you put the salmon and veggies on the grill because all of the chopping definitely takes longer than it will to cook your grilled foods.